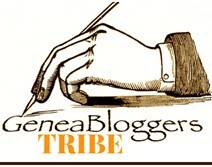 Welcome to the geneablogger family! There are many great blogs in our group that will keep you inspired. Thanks, I really enjoy reading stories from other trees. It’s been almost a month since we’ve heard from you – all OKAY? Yes, just battling a spring-full of allergies and bronchitis. Feeling better now, and so anxious to get back to blogging and genealogy. Am working on a Memorial Day post celebrating and honoring the service men and women in my family. Thanks so much for your service as well. Thanks for so much reading on my site, you must have been busy this summer.